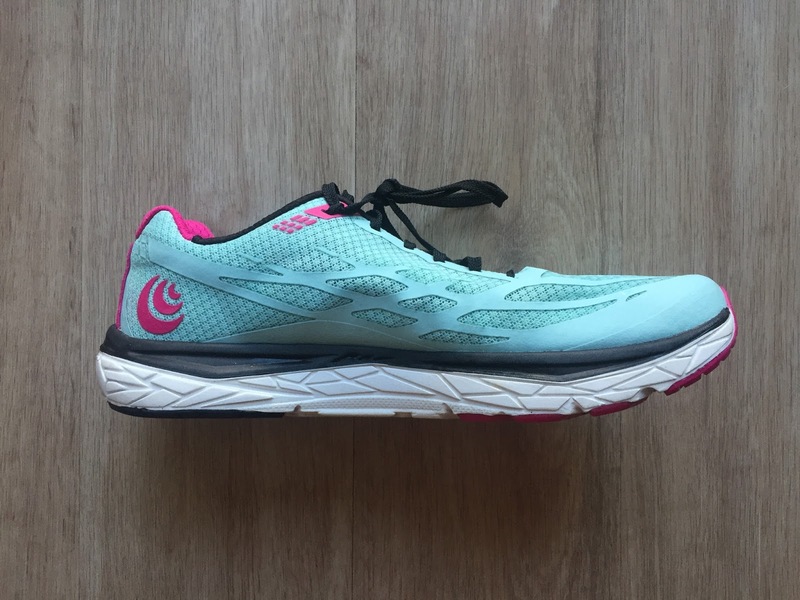 The Topo Athletic Magnifly 2 updates the original Magnifly (RTR review) with a change in geometry from a 25mm heel/20mm forefoot, 5mm drop to a 25 mm heel and forefoot zero drop geometry. The midsole is now dual density with softer foam underfoot for cushion and firmer foam below for response. It gains 0.6 oz in weight over the Magnifly 1 which very likely is due to the added 5mm foam in the forefoot. Magnifly features a new and more streamlined seamless upper. It retains Topo’s signature anatomical toe box. At first glance: Whoa, what a striking shoe! The colors are bright (brighter than the photos seen on the Topo Athletic website) but not too saturated, and the pink/black accents complement the ice blue upper in a pleasing way. The overall look is streamlined and attractive, something that can be difficult to achieve with a zero-drop/wide-toe-box shoe. My women’s 11 fit true-to-size and was comfortable right out of the box; no break in period required. Topo bills the Magnify 2 as having a “2nd skin fit and feel”, and the shoe lives up to these expectations. 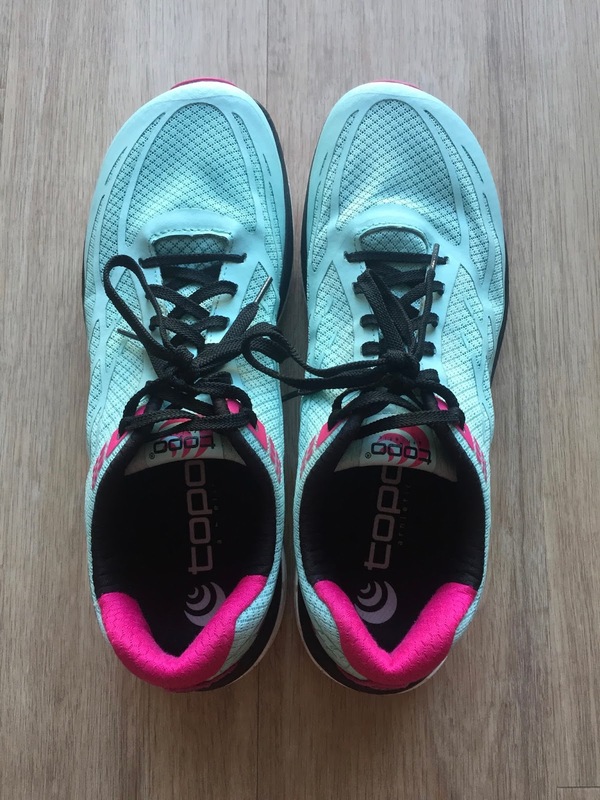 The upper is airy and soft, hugging the midfoot and heel in a comfortably fixed position while providing plenty of room in the toes to splay up front. Thoughtfully-placed overlays provide additional structure and support in high-wear areas. The tongue is padded, but not overly so, providing good protection from the laces for those (like me!) who prefer a very secure midfoot fit. The outsole rubber and geometry are well-suited for both road and smooth dirt trails. With just under 40 miles on the shoe, I’ve noticed a little wear on the midfoot and heel, but nothing out of the ordinary. I expect to get many more miles from the Magnifly 2. With a 25 mm stack height, the Magnifly 2 provides a generous amount of cushion underfoot. Sometimes this amount of cushion can result in a mushy ride. However, thanks to the multi-density midsole – which contains a softer layer by the foot and a firmer layer on the bottom – the shoe is surprisingly snappy and responsive. Add in the rockered toe, and you’ve got a smooth, protective ride that’s well-suited for long runs on the road. One important thing to note is that the shoe is zero drop. Those used to running in higher drop shoes might want to be cautious if transitioning into the Magnifly 2. That said, I rotate through shoes of varying stack heights in my training had no issues adjusting to the zero drop! The Magnify 2 strikes a impressive balance between attractiveness, comfort, and function. I’ll definitely be reaching for my pair quite a bit going forward! At $110, the shoe makes for a great daily trainer and also shines on longer runs. I also wouldn’t hesitate to take it out on easier trails. The Torin 3.0 is about an ounce lighter than the Magnifly 2 and has a slightly higher stack height (28mm vs. 25mm). Both are zero drop and have wonderfully roomy toe boxes, but differ when it comes to fit and ride. The Torin 3.0 upper is comfortable, but looser in the midfoot and heel compared to the second-skin-like fit of the Magnifly 2. Additionally, the cushioning of the Torin 3.0 is more pillowy than firm, resulting in a softer feel underfoot. 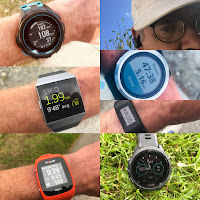 I wouldn’t hesitate to use either for long runs, but would choose the Magnifly 2 for workouts and/or faster-paced efforts because of its snappier ride. Larisa Dannis is an accomplished ultra and road runner winning the Javelina Jundred in 2017, placing 3d in the Western States 100 and clocking 2:44:15 at the Boston Marathon in 2014 for an Olympic Trials qualifier. 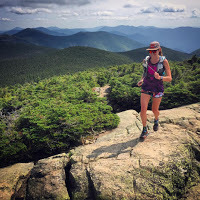 Based in New Hampshire she runs rugged technical terrain in the White Mountains on the weekend and roads during the week. For Larisa's full run bio see our Reviewers Bio Page here. The Magnifly was provided at no cost.The opinions herein are entirely the author's. Thanks for the review, Larissa. Just to clarify, isn't the stack height 25mm instead of 21mm? I think you are correct. Running Warehouse had 21mm and usually accurate. Topo and Larisa had 25mm. Changed to 25mm. Thanks! How does this shoe compare to the escalante? If not similar, what shoe or shoes are similar? Furthermore, is there a specific ETA on the escalante 1.5? Thanks, you all rock! Thanks for kind words,reading and asking. I did not run the Magnifly 2 but did the v1, Escalante, and Torin. The Escalante by the numbers is lighter, has less stack with a springy dynamic EGO which for sure was more dynamic than Magnifly 1. The Magnifly 2 has a soft conventional mesh upper with overlays while Esaclante has engineered knit. I tend to prefer conventional light uppers over knit. The Torin has more stack than Magnifly and you can see in Larisa comparison is softer and also is lighter. 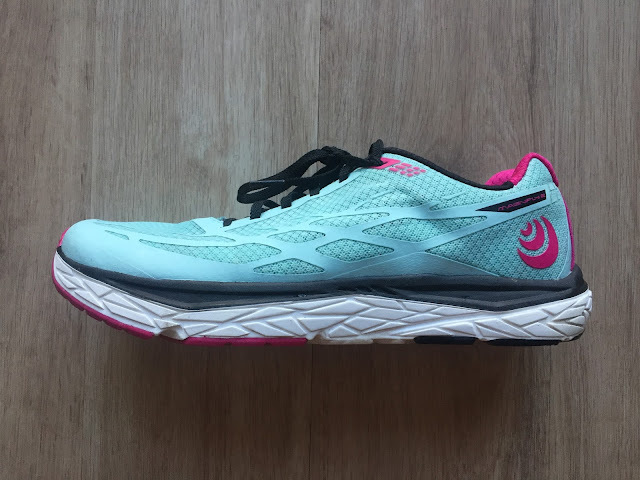 It is the closest comparison to Magnifly along with the Altra Instinct version 4.5 we just received for testing which is a bit lower stack and about the same weight as Magnifly 2. We expect to have Escalante 1.5 for testing in the next few weeks as it is a Spring 18 shoe. I do not have my notes on the update with me but believe it is new version of the engineered knit upper. Larisa, thanks for the review. Appreciate and always welcome candid feedback. Sam, to help clarify for your readers on the topic, Altra EGO compound vs Magnifly 2 platform, I believe EGO is a compression molded EVA foam compound with rubber or TPU type materials included in the compound to help resist compression set. Magnifly 2 is a 2 density injected EVA foam, as Larisa points out, softer closer to the foot, firmer and snappier on the bottom layer to help with propulsion and response. The rubber outsole of Magnifly 2 is co-molded onto the EVA, -- virtually no compression cement below the midsole top line, to create a more natural feel. Very rare, because It means an extra set of molds is required in manufacturing. 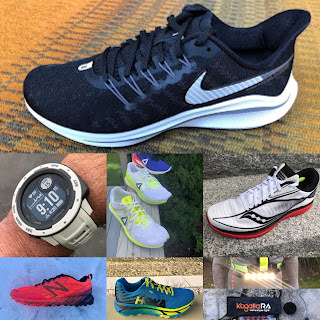 People often remark the 25mm 0 drop platform of Magnifly 2 doesn't feel that big, and with the exaggerated toe sweep, it actually runs quite fast for a 0-drop shoe. Both Escalante and Magnifly 2 are great 0-drop road shoes.